While the Mayans have built monuments as early as the 10th century B.C. throughout parts of Central America, their civilization was winding down by the mid-9th century A.D, except in the Yucatan Peninsula of Mexico. 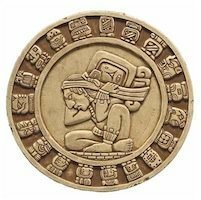 However, the Aztecs picked up the Mayan Calendar and read the calendar date not as a cyclical turn over, but as an apocalyptic end of the world.